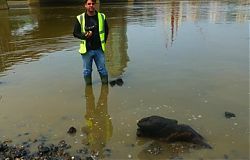 June was scheduled to be a good month for low tides, so the Vauxhall FROG decided to take advantage of the opportunity and do a bumper monitoring and recording session. Vauxhall FROG is small, usually only John, Roger, Jan and Sunny (although other people also come along sometimes and all FROGs are very welcome) so the amount that we’re able to see and do in any one visit is limited. 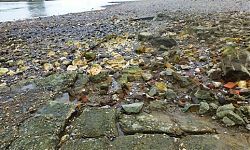 There are numerous features of an industrial nature, probably from the 19th and 20th centuries, which are relatively high up on the foreshore. We get to see these all the time. 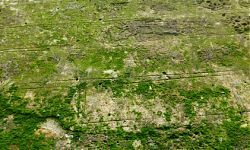 However, this site is also known for earlier archaeology, including a Bronze Age structure, some Mesolithic timbers and Anglo- Saxon fish-traps. Getting a good look at these is fiendishly difficult due to their positions, right at the lowest water levels. For the best part of a year, even seeing these timbers at all has been partial, fleeting or impossible. 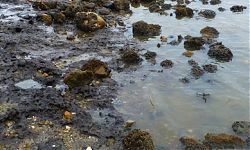 Three days of low tides gave us an opportunity to focus on a very small area each day. 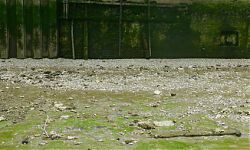 Roger, John and Sunny did a broad sweep of the foreshore to check on some features and also to have a look at the condition of the ground surface. 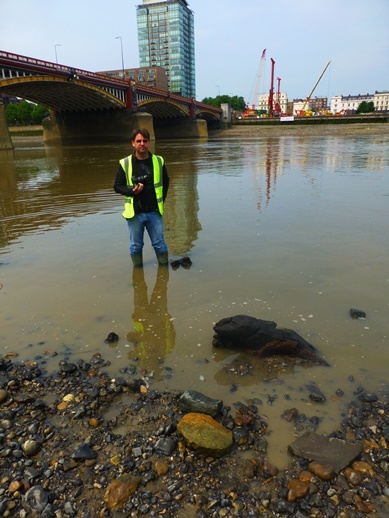 There has been a lot of erosion at this site over the last 12-18 months, for example, we’ve seen a noticeable change just on the downstream side of Vauxhall Bridge, with successive levels being scoured off to reveal the next layer underneath. 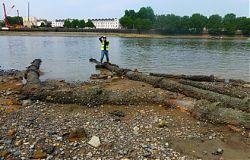 We wanted to re-examine the Bronze Age structure and to get some measurements of the height of each timber in order to better monitor possible erosion in this area from increased vessel wash. We also wanted to have a particular look at the timbers of the fish-trap nearest St. George’s Pier, because erosion in this area has been resulting in it standing more and more proud of the foreshore level, and it was starting to resemble a wobbly tooth. 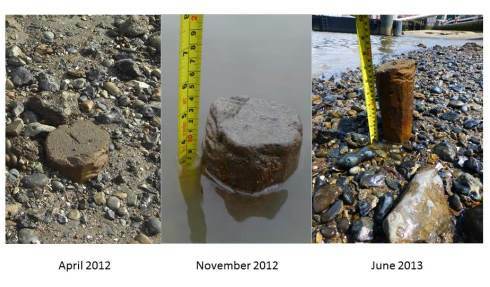 The images below show the gradual emergence of this timber over the last fourteen months. We decided that if it looked like it was about to erode out completely, we’d recover it and try to keep it available for future study. To this end, we’d come armed with cling film and plastic bags to wrap it in to prevent it from drying out. 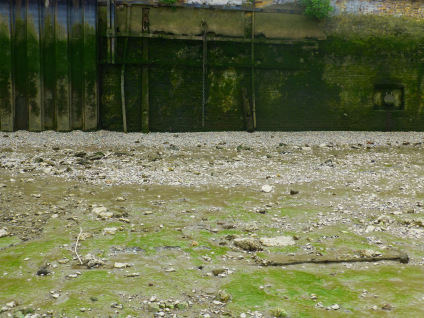 I should say that this stretch of foreshore is a ‘no dig’ zone, so there was no question of actually excavating it. 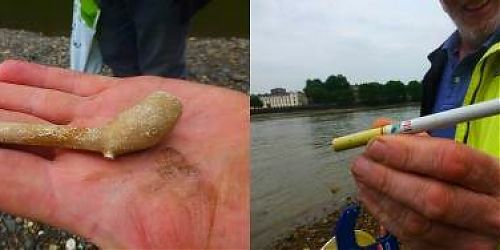 Rather, we were hoping to grab it more or less as it popped out rather than lose it to the river. Unfortunately, I was unable to get down to Vauxhall on Day Two due to a work commitment (boo). Luckily Roger, John and Jan were able (hooray). 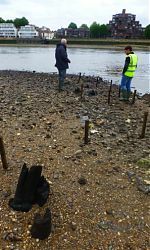 As the tide was very low again, they were able to complete the photo-record of the Bronze Age structure and recover the fish trap timber. 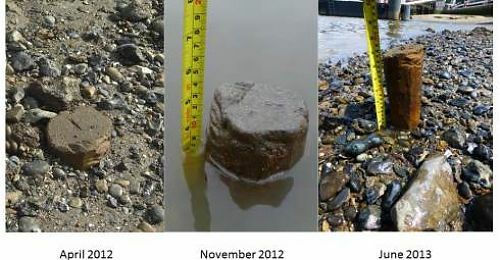 John’s photo (right) just shows how little of the timber was actually still in the foreshore (~8cm). This wouldn’t have lasted much longer, so recovering it when we did was very timely. Hopefully at some point we’ll be able to get a specialist view on the tool marks, and possibly a date. We’ve been assuming that it’s Saxon, but in truth we don’t actually know, so even a very broad date would be fantastic. 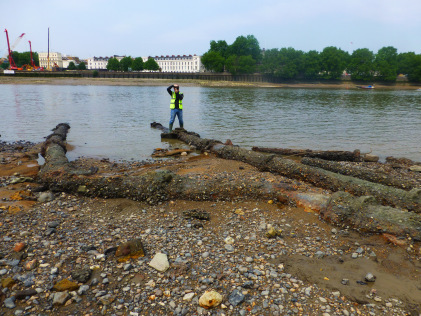 This session focused on the foreshore between Lack’s Dock and Vauxhall Bridge, where there are several Mesolithic timbers, several fish-trap-sized timbers, undated; and several timbers which have not been recorded (other than photographed), which are undated and which we’re unsure whether they are trees or worked timbers. 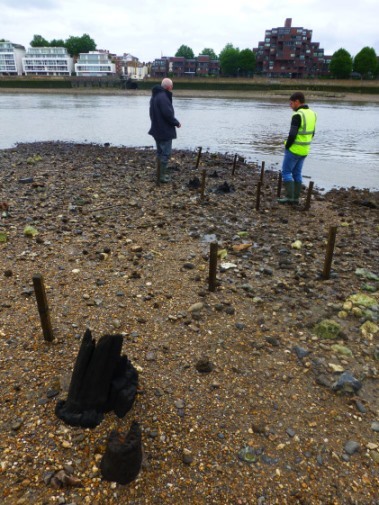 Because all of these timbers are very low down on the foreshore, getting a look at them can involve an inordinate amount of standing around waiting for the tide to go out, wading calf-deep in the river, running back quickly when a boat goes past, and chin-scratching. Ideally we’d love it if the lowest timbers were exposed completely for a reasonable amount of time, but in practice, we get what we get; usually only brief and/or partial exposure. 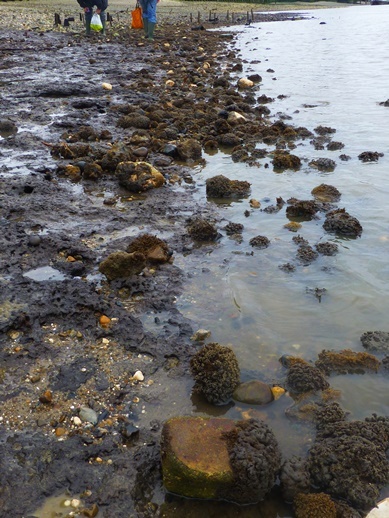 Along the stretch of foreshore near the Bronze Age structure, there are a positive bloom of sponges! 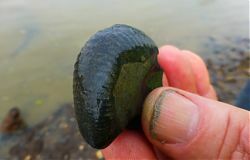 We haven’t observed this before and there were absolutely loads of these all along this stretch, where there are peat deposits and sand. If anyone has any idea why these have popped up now, we’d love to know. Whilst retreating from the incoming tide, we spotted yet another timber box structure to add to the long long list of random timber box structures on this site. This one hasn’t been seen before, but has been exposed by the erosion of the gravel bank. 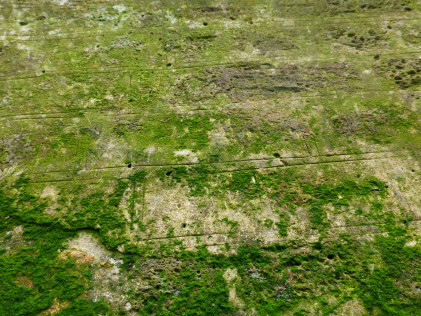 We were struck by the possible relationship between the box structure and the blocked-up dock entrance and speculated on whether there was a connection and, if so, what sort of structure may have been associated with the dock; jetty or landing stage, mooring feature, some sort of booking-in office. We don’t know yet, but we’ll keep asking the questions. It’s a little tricky to spot in the shot (above), but squint and you should be able to see it. The edge of the entrance to the little dock is where the metal shuttering meets the curved edge of the brick wall. We also had a closer look at the embankment wall immediately upstream of the Bridge and John spotted something rather odd. We were looking at areas where the construction differed between stone blocks and brick, due to repairs and modifications, and closer inspection revealed that some of the ‘bricks’ were actually just drawn on into the wet concrete (?) coating over areas of the wall. Fake bricks! Presumably this was done to improve the appearance of the wall without going to the expense of replacing the brickwork. The gas pipes downstream of Lack’s Dock were more fully exposed than we’ve seen before, and we got so see how really huge they are. These are associated (we assume) with the London Gasworks, but as there have been several gas companies with sites in this area, we’ve got a bit of work to do on confirming exact locations. 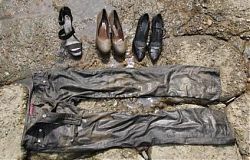 Shoes: No idea what’s going on here, but there are loads of high-heeled shoes under Vauxhall Bridge. The collection grew over the three days and there were even a couple of pairs! 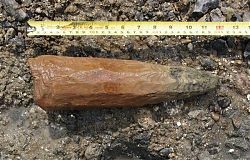 Smokes: evidence for smoking both ancient and modern in the form of a clay pipe and an electronic cigarette! 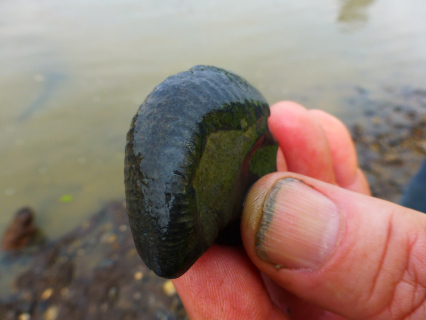 Fossil: the find of the week by Roger! We had a fantastic three days at Vauxhall. 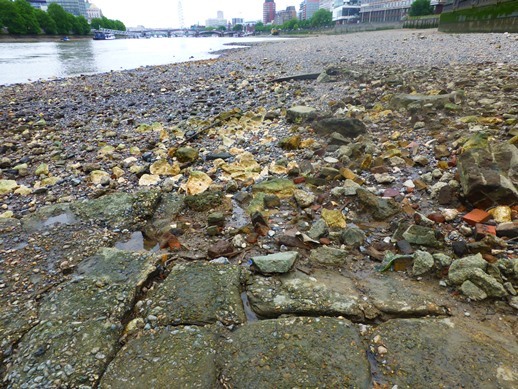 To find out more about the work of the Vauxhall Foreshore Recording and Observation Group, please visit our new blog: Fawkes Hall on the Thames.